Click on this link if you need more information about an accelerometer. 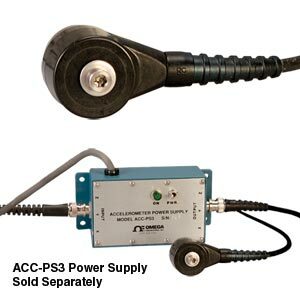 The ACC102A accelerometer uses a shear mode design for high performance. It has a rugged stainless steel inner structure covered by a moulded polymer. This construction makes the ACC102A impervious to harsh environments, such as alkaline coolants, hot oil and water sprays, resulting in long, reliable service. Additional features include high shock protection (to protect from dropping or mishandling), cross wire protection (protects against mis-wiring), and up to 1000 volt static discharge protection. The ACC102A has a high 100 mV/g output and measures across wide frequency and acceleration ranges. A low impedance cable allows for runs up to 300 metres. The ACC102A exhibits the low noise floor and high amplitude linearity you’d expect in more expensive units.